Building a magic deck is kind of similar to opening a restaurant. Being both a foodie and a commander connoseiur, I thought it would be fun to build a theme deck around two of my favorite passions. Karador, Ghost Chieftan is the perfect balance of thematic flavor and gave me access to a whole slew of cards by being knowledgeable in cooking in 3 different colors of mana. I imagine Karador giving out the big orders as the head chef with Vorinclex being right behind him as his soux chef supplying him with tons of mana. I definitely still wanted to include Kozilek, Butcher of Truth but station him in the protein section where he could Slice in Twain all sorts of delcious things. Its a rather large job, so to help out Kozilek, I figured Buthcer of Malakir, Mindslicer, and even Butcher Ghoul would all be useful. Its important to have a good relationship with your suppliers, and that is where Teneb, the Harvester is really going to shine. In conjunction with Soul of the Harvest and Harvestor of Souls, I expect to always have plenty of Fresh Meat and to Cultivate enough goodies to Feed the Packs of other planeswalkers sitting down at the table with me. One of the biggest things that food service inspectors will nail you for is Contamination. I plan on running a very tight kitchen that is very careful to Wipe Clean my counters and be careful that our “spirits” don’t Oxidize and turn into Acidic Slimes. Just wanted to let you know I really enjoyed this article and would love to see more. I check back on this blog once a week hoping for updates. This kind of theme deck that is still well crafted is a lot of fun to read about. 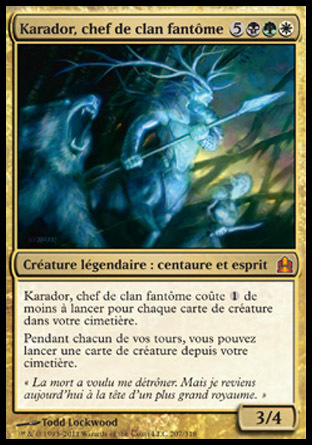 My hope for Karador is to come up with a Kare Bear list… some way to make bears, both actual bear creature type and bears by power/toughness viable in EDH. If you have any thoughts on that, let me know.